If you want to shoot your AK or SKS at an indoor range that doesn't allow magnetic ammo, you'll need something other than steel cased rounds. 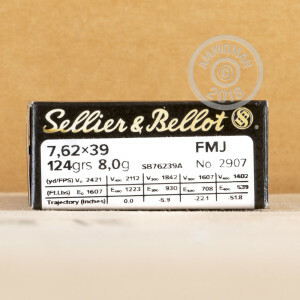 Of the few companies making brass-cased 7.62x39mm ammo, Sellier & Bellot is one of the most well-known. Like other S&B ammo, these cartridges are reliable and accurate without costing an arm and a leg. 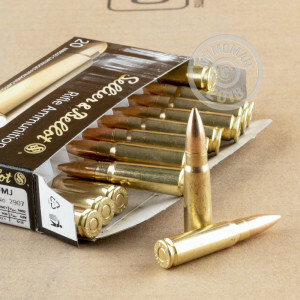 Each cartridge in this bulk priced case of 600 fires a 123 grain full metal jacket bullet at 2,421 feet per second with similar ballistics to common steel-cased ammunition. This Czech-made ammo uses non-corrosive Boxer primers, which facilitate reuse of the brass cases for those who reload. Pick up this 600 round case at AmmoMan.com to instantly earn our most popular discount: free shipping for all orders over $99.